With a stay at this villa in Protaras, you'll be near the beach, within a 15-minute drive of Ayia Napa Monastery and Cape Greco National Forest Park. The front desk is staffed during limited hours. Free self parking is available onsite. With a stay at Villa Attica in Protaras, you'll be within a 15-minute drive of Ayia Napa Monastery and Cape Greco National Forest Park. 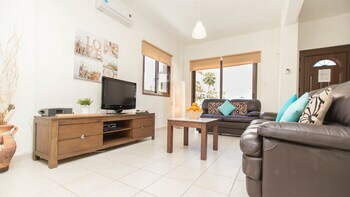 With a stay at this apartment in Protaras, you'll be by the sea, within a 15-minute drive of Ayia Napa Monastery and Profitis Elias Church. Free self parking is available onsite. With a stay at this villa in Protaras, you'll be near the beach, just a 4-minute walk from Protaras Coastal Promenade and 14 minutes by foot from Sunrise Beach. Free self parking is available onsite. When you stay at this villa in Protaras, you'll be near the beach, within a 15-minute walk of Protaras Coastal Promenade and Kalamies Beach. Free self parking is available onsite. With a stay at this villa in Pissouri, you'll be within a 15-minute drive of Aphrodite's Rock and Aphrodite Hills Golf. Free self parking is available onsite. When you stay at Vineland Bay Villas in Pissouri, you'll be near the beach and 14 minutes by car from Aphrodite's Rock. Free self parking is available onsite. Located in Paralimni, Photothea Apartments is a 4-minute drive from Protaras Ocean Aquarium and 5 minutes from Trinity Beach. When you stay at Ozalos 13 in Ayia Napa, you'll be near the beach, within a 15-minute walk of Ayia Napa Monastery and Ayia Napa Town Hall. Free self parking is available onsite.